Whether you're driving to work or embarking on a six-hour road trip, the iPhone gear you bring along can help ensure a smooth journey. It's all about comfort, convenience, and the feeling of being fully connected, even as you're gaining traction on the highway. Here's a list of must-have iPhone acces­sories and apps to make your next trip easier, and with a little luck, more fun. Car chargers have been around awhile, and are almost interchangeable, so choosing the right one for you might come down to size, speed of charge, and availability. Though it's always a good idea to charge your iPhone before head­ing out on the road, having a car charger offers the security of knowing that the infamous "20% of battery remaining” warning won't slow you down one bit. Chargers are all about peace of mind, and giving your phone a much-needed jolt. The bestselling PowerJolt offers ev­erything you need from a car charger — namely, dependability — and it works with a variety of Apple products. This versatile charger plugs into your car's 12-volt power outlet and includes a detachable USB Type-A to 30-pin dock connector cable, making it compatible with your iPhone and all charge-by-USB iPod models. It also features a con­venient charging status light. And check out the price! You can't beat that. Not only will this handy dual charger from InCase charge your iPhone, iPad, or iPod, but it will also charge your GPS and other electronic devices. One nifty feature is that, thanks to its 2.1 Amp ca­pacity, it can take on two iPads at once! It features two USB ports and works with most 12-volt outlets. There are a plethora of iPhone acces­sories available that are built to let you concentrate on keeping your hands on the wheel and your eyes on the road. From enabling phone conversations to assisting with navigation, these gadgets help mini­mize distractions and eliminate scrambling for your iPhone when it's sliding around the dashboard or buried in your purse. Going hands-free has never been easier! Griffin has a great line of products that give new meaning to the term "hands­-free." These music-playing accessories of­fer a lot of convenience with minimal fuss. The iTrip DA for the iPhone and iPod fea­tures Griffin's FM transmitter technology so you can listen to your radio without an auxiliary line from your car, home stereo, or boombox. All you need is the iTrip Control­ler app (free, app2.me/5219) to get started. The Exomount features a patented suc­tion technology that holds your iPhone in place as you make calls or use your GPS. It's basically a giant clamp, but the simple and sleek design with multi-angle rota­tion makes it easy to insert and remove your iPhone, and use it at your preferred viewing angle. Wondering how serious that "check engine" light might be? 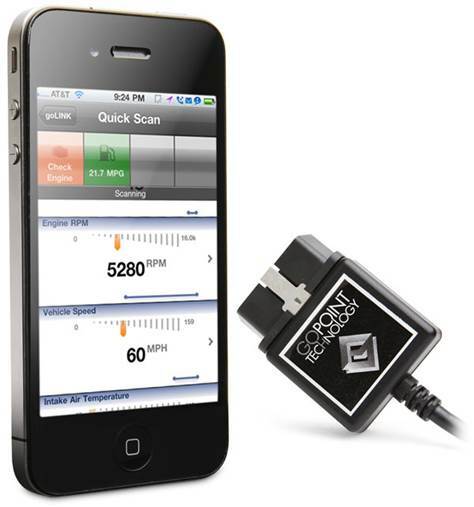 Get the GL1 Vehicle Diagnostics tool for iPhone — it works like your very own AutoZone representative. The GL1 plugs direct­ly into your car engine's On Board Di­agnostics (OBD) data and shows you on your iPhone whether you'll need to get it fixed ASAP or wait for your mechanic to have a look. Sure, you've got a data package, but if you're going the road-trip route, your passengers may want access to Wi-Fi as well. Some newer cars come preinstalled with mobile Wi-Fi; if you don't own one of these shiny new vehicles, this device is a nice alternative. Sometimes, being able to slide the Wi-Fi setting to the On position — and save on cell phone data charges — is its own reward. This device literally turns your car into a Wi-Fi hotspot. It works with phones, tab­lets, e-readers, and of course, laptops. It's possible that even during the best road trips, your family might want to do separate tasks, together — the Autonet Mobile Router makes this possible. Your "virtual" gear is almost as important as the physical stuff you take with you on the road. From radio to remote controls to GPS navigation, there's a wealth of apps to get you through your trip. Here are a couple of choices to consider. Satellite radio's great, but if you want to for­go the monthly fees, the TuneIn Radio app is the next best thing. You can find over 70,000 stations from all over the world, broken into categories like sports, talk ra­dio, and any genre of music you can imag­ine. What's more, if you're enjoying a radio station on your way through Kentucky and want to keep that listening experience, all you have to do is dial in on this app. 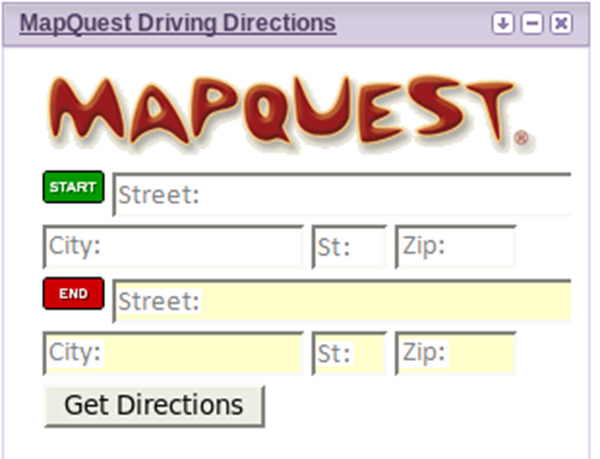 MapQuest guided most of us before GPS became the in thing. Now, not only does MapQuest have a free app, but it also offers the comforting turn-by-turn voice navigation that's become the standard of 21st century road trips.